It has been a year since the launching of the new indexing database Dimensions. 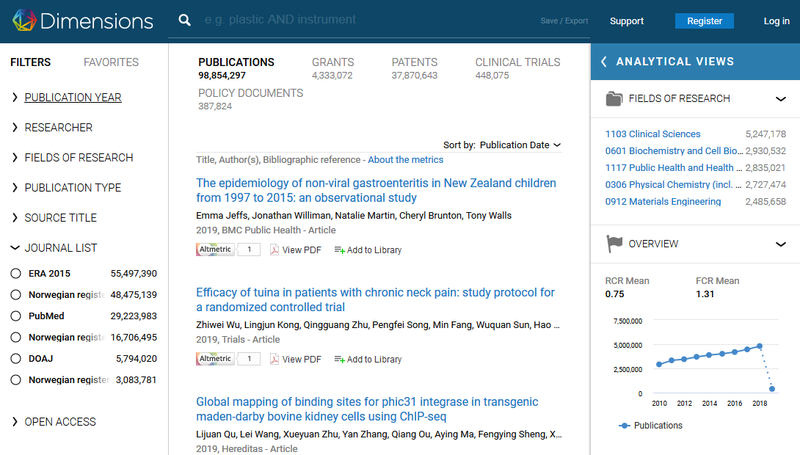 It contains metadata about more than 98 million publications (journal articles, book chapters, proceedings, monographs, etc. ), 37 million patents, 400,000 clinical trials, 350,000 policies and more than four million projects. Further expansion is planned in 2019, to include new sources of information. The company behind this ambitious project is Digital Science in collaboration with Altmetric, Figshare, Symplectic, DS Consultancy and ÜberResearch, accompanied by more than a hundred partners from all over the world. The Dimensions database combines a traditional citation database, a search engine and analytical tools. 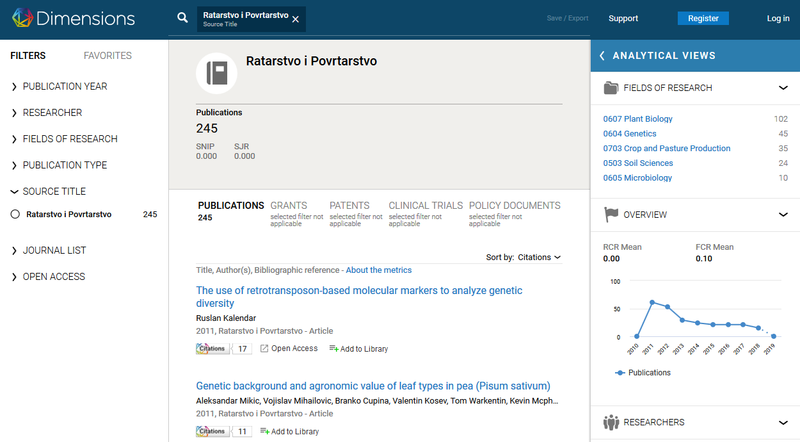 The partnership with Altmetric has made it possible to track mentions of publications in the sources that are not covered by traditional bibliometrics. The business model used by Dimensions is popularly known as ‘freemium’: a set of basic functionalities (in this particular case, search engine and metadata for publications) are freely available to anyone, whereas the access to other functionalities is reserved to subscribing institutions. 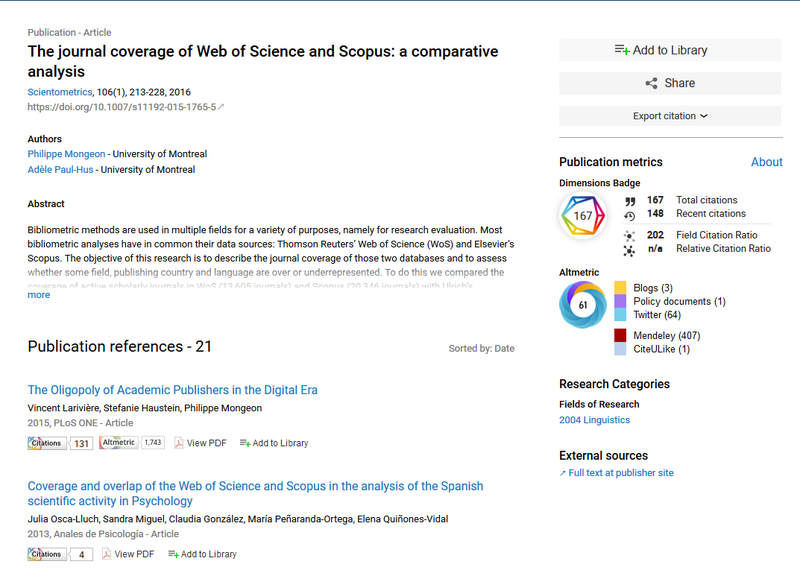 In this respect, it is different from the traditional citation databases (Web of Science and Scopus), which are available through subscription only. As opposed to the Web of Science and Scopus, which index only selected publications (journal articles, conference proceedings and monographs) that meet specific technical requirements and the criteria of international relevance, the Dimensions database seeks to aggregate data from as many interoperable sources as possible. Therefore, it indexes journals already indexed by PubMed, DOAJ, ERA 2015 and the Norwegian Register. Due to this, metadata from 66 Serbian journals indexed in DOAJ through SCIndeks can be found in Dimensions. As already reported, late in 2016, CEON/CEES developed an organizational scheme and a web application intended for collective application of SCIndeks journals to DOAJ. The system called Policy and Licensing Support Service (P&LSS) assists editorial boards in defining their publication policies in accordance with international ethical standards and good practices in scholarly publishing. Both the application for indexing in DOAJ and metadata delivery to this aggregator are done with the consent of the publishers. The metadata created by the SCIndeks team are delivered to DOAJ free of charge with the aim of increasing the international visibility of SCIndeks journals. It is available to all journals subject to quality control in SCIndeks (professional and advanced packages). Once the editorial policy is defined and verified, the SCIndeks team submits the application to DOAJ on behalf of the journal. When the journal is accepted for indexing in DOAJ, article metadata are regularly delivered to DOAJ by the SCIndeks team. Through this channel, the metadata reach the Dimensions and no additional effort on the part of editorial boards is required. This service, which is freely available to SCIndeks journals, seeks to increase their global visibility, at the cost of decreasing SCIndeks visits.